The Shark HV382 TruePet Rocket is an ultra-light vacuum with a detachable handheld. The DUO CLEAN Technology has an integrated dual brushroll system (soft brushroll and bristle brush) for better cleaning on hard floors or carpeting. TRIPLE PARTICLE CLEANING tackles 3 types of floors messes; large (without snowplowing), small and stuck-on particles, from both carpets and floors. Includes the TruePet Mini Motorized Brush and Extendable Under Appliance Wand to get into tight areas. 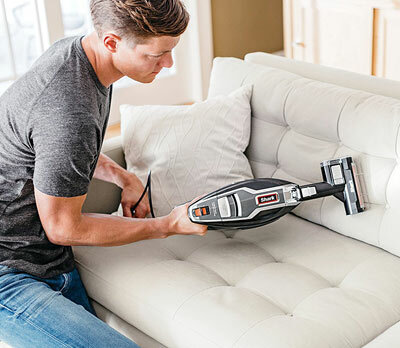 The HV382 is made to tackle pet hair, and the TruePet Mini Motorized Brush, can pick up hair, dust and dirt from pillows, upholstery, carpets, stairs, and car interiors. Both the handheld and the full unit have integrated LED headlights to see under furniture, dark closets, and other low light areas. Maneuvering around furniture is easy with the built-in swivel steering. The wand can be attached to the handheld for high cleaning. Floor Settings: For Bare floors and area rugs, you slide the power switch on the vacuum to the bare floor/area rug setting. The brushrolls will spin slowly in this mode. Carpets: Slide the power switch to “high-pile carpets”. The brushrolls will spin quickly in this mode. Shark HV382 Upright Vacuum Cord Length: 30 feet. Smart-Review Commentary: The Shark Rocket HV382 combines a powerful lightweight upright vacuum with a detachable handheld vacuum. Swivel steering makes it easier to maneuver than traditional fixed wheel vacuums. Shark has a DUO Clean brushroll system to held clean both hard floors and carpets. The TRIPLE PARTICLE CLEANING allows the Shark HV382 to vacuum large, small and stuck on particles. The included motorized pet tool attaches to the handheld vacuum and will get ground in dirt, pet hair, and dust off your upholstery, stairs, and car interiors. Shark also includes other tools to help in cleaning. This model has received excellent reviews by consumers. This model is a Smart-Review top pick and a great value for ultra-light vacuums. Description: The Shark Rocket TruePet DuoClean HV382 stick vacuum is a powerful lightweight vacuum from Shark. The DuoClean brushes provide triple particle cleaning. The detachable handheld can be used to vacuum stairs, upholstery, drapes, and smaller areas of your home. This model includes allergen filtration, a 30 foot cord, and LED headlights. The motorized brush is ideal for pet hair. The HV382 is a SmartReview.com top pick for lightweight stick vacuums.